Christmas is a special time of year for Arizona families and the Holidays are celebrated in many different ways. 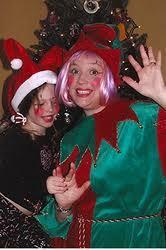 If your plans include a Christmas Party, we can help you create wonderful memories for your children and guests. We offer a wide variety of Christmas themed entertainment including a "Real Bearded" Santa Claus that can visit your party or make a special trip to your home to spend some quality time with your kids. At home your little ones are in a comfortable non-stressful setting. You don't have to fight the holiday traffic and stand in line for hours at the mall only to have your kids rushed through so you can be sold pictures. Why not take all the time you need to get the perfect picture of your kids interacting with Santa in front of your own Christmas tree and holiday decorations? Invite a "Reindeer" Pony to your home just for your kids or grandkids, or how about an old-fashioned Hayride to view lights? 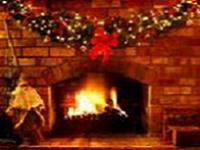 Start your new Christmas tradition today, call us at 480-820-8030 for details. Are you involved in planning your corporate holiday party? Whether you volunteered, were "drafted" or are a business owner wanting to do something special for your company family this holiday season, we can help make your workload a little lighter. 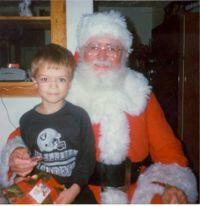 Start with our Santa Claus, we offer the "real bearded" kind as well as the more economical traditional costumed Santa. 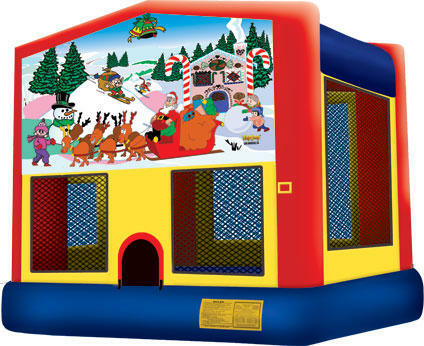 Add a few Elves to do face painting, balloon animals or crafts and you have the foundation of a great Holiday Party. The goal is to keep the kids entertained while your employees enjoy time together without the daily stress of the job. We can help you balance the needs of a varied age group. We offer "Reindeer" Pony Rides, our decorated Christmas Corral Petting Zoo, Hayrides, our Holiday Express Choo-choo Train, a Ferris Wheel, as well as Inflatable Bounces and Slides. We also rent tables and chairs and just about whatever else you need so you can get it all from one place. Now that's easy! 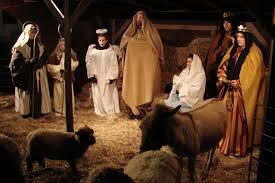 If your Church is planning a Living Nativity or Christmas Pageant, we can supply the animals you need to make it an authentic display. We have a Donkey, Sheep, Goats and Poultry available for rental. Our animals are hand-tamed and can be handled easily by your volunteers. These are not animals plucked from a farm to make extra money for Christmas. They've been raised for our petting zoos and are handled, pet and loved by children all year long. We've supplied a variety of Church's with animals for Living Nativity's, as well as Christmas, Easter and Palm Sunday Pageants since 1990 and would love to be a part of your special celebration. Ask us about our School program "The Animals of Bethlehem". Imagine the faces of the children as they sit on Santa’s lap and ask for that special gift. Our trained children’s entertainers are “Real Bearded” Santas (portly older gentlemen who have authentic white whiskers and hair). Santa can help pass out gifts, or pose for your pictures. He can pass out candy canes for the little ones too! * Call for Christmas Eve details or Christmas Day pricing. Travel charges may apply. We’ll bring Santa’s favorite Ponies decked out in Holiday attire and jingle bells (complete with antlers!). Children of all ages love to ride "Reindeer" Ponies. * Call for Christmas Eve or Christmas Day pricing. Your favorite Holiday Tales are read by some of Santa’s best helpers! These talented elves are face painters or balloon artists too! A collection of the Jolly Fellow’s friendliest little animals in a portable pen, decorated for the occasion and ready to be touched and loved by your guests. 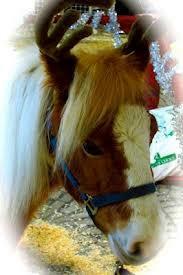 The Christmas Corral will make your event special. 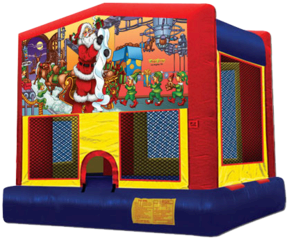 Special weekday pricing on our inflatable jumps. A great addition for any party. 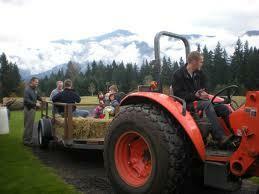 Enjoy a winter's ride on our tractor pulled Hay Ride. Great way to enjoy Holiday lights with a large group. 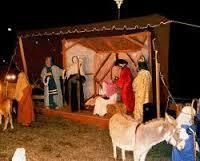 Our "Living Nativity" provides you with the animals for your Christmas Pageant or display. We offer a Donkey, Goats, Sheep and other animals from our petting zoo that can be lead, staged or pet. We create custom packages based on your needs. Call 480-820-8030 or email for details. 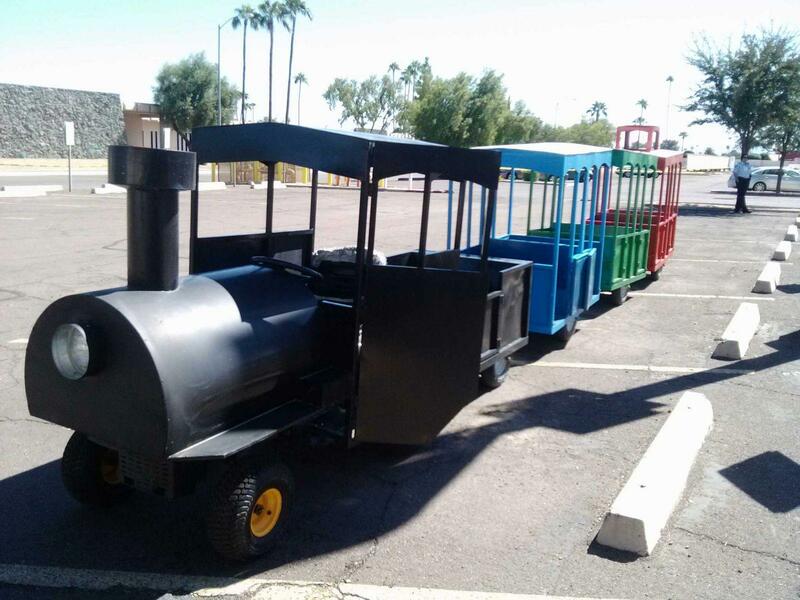 Our Kiddie Train is just the ticket for groups of any size or age. The colorful cars can be decorated for the season and can travel on parking lots, sidewalks, grass or playgrounds. A great way to view Christmas lights. Our climate does not allow for much snow play (without a drive to the mountains), but you can enjoy some of the fun of a toboggan ride with our 15’ ice blue Inflatable Slide! Kids create beautiful Holiday Cards or ornaments with our Spin Art Machine! Enjoy a Christmas Dance Party run by a few of our cutest Elf Dance Teachers. Get into the spirit with two of your favorite characters. 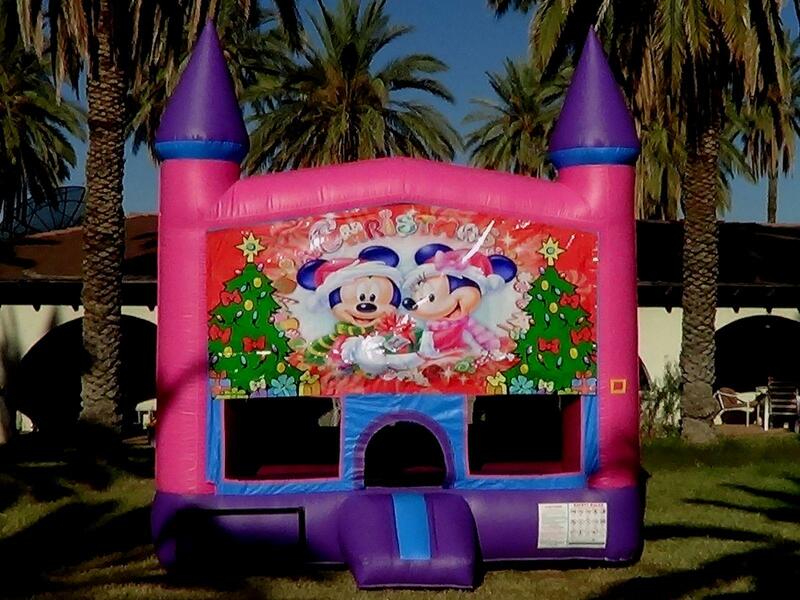 This Christmas themed Bouncer is avaiable as a Pink and Purple Castle or Fun House.Just let us know which one you prefer. Try a Popcorn, Snowcone or Cotton Candy Machine to add flavor to your event.